Saudi Aramco made its financial information available in a prospectus for a $10 billion bond sale, which the company plans to use to finance a nearly $70 billion stake in Saudi Arabia's petrochemicals company. 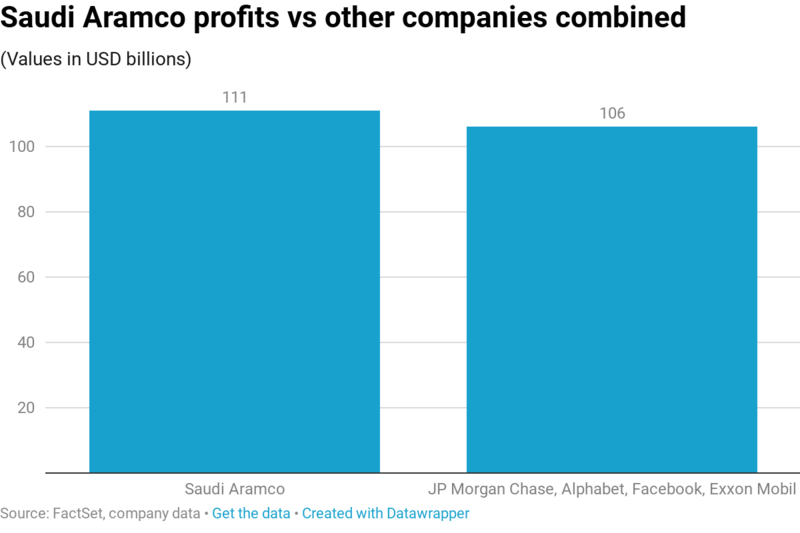 Despite Aramco's massive earnings, the company did not receive the top credit rating from agencies like Moody's since its heavy dependence on the country's economy could be a headwind for the company. Moody's issued an A1 rating for Aramco. Companies like Chevron and Exxon Mobil have ratings of Aa2 and Aaa, which are higher than Aramco's. "Credit linkages to the government of Saudi Arabia (A1 stable; A1 foreign currency ceiling) are significant, and result in our decision to constrain Aramco's rating to that of the government," Rehan Akbar, senior credit officer at Moody's, said in a note. "While there is a clear track record of Aramco having been run as a commercially independent company, the government's budget is highly reliant upon contributions from Aramco in the form of royalties, taxes and dividends," Akbar added.